The Good Pitch North America Tour is entering its third year with a new partner and a new venue, but the same ambitious goal; to fast-track effective, world-changing partnerships between documentary film and the brand, NGO, philanthropy and media sectors. The Channel 4 BRITDOC Foundation, in partnership with the Sundance Institute Documentary Film Program, are delighted to announce that the touring funding and networking forum the Good Pitch will be returning to New York City on May 20th 2011 hosted by the Ford Foundation at their midtown headquarters. 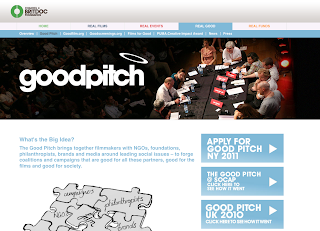 The Ford Foundation joins the Tides Foundation, the Fledgling Fund, Chicken & Egg Pictures, Impact Partners, Crosscurrents Foundation and a number of anonymous donors as supporters of the Good Pitch. Working Films continue to provide campaign development for the invited filmmakers.